James Dorward Maver Sr. was born June 12 1898 at 242 W. 143 Street in New York. He was the first generation of his family to be born in America. His parents William Robert Maver (1858-1936) and Christina Tytle Dorward (1862-1944) from Brechin, Angus, immigrated to the United States in 1882. William Robert is listed as a carpenter in the 1910 US Census and as an organ builder in his death certificate. James' siblings were: Arthur born about 1883 (became a policeman), David born about 1885 (became a boat builder), Ruth born about 1888 (worked as a milliner), Helen born about 1889 (became a registered nurse), and William born about 1892 (became a clerk or accountant). James D. Maver enlisted in the United States Marine Corps and served during the first World War. During the second World War, he served his country as a "dollar a year man" presumably in his capacity as president of Hanes Hosiery Inc. of New York City. 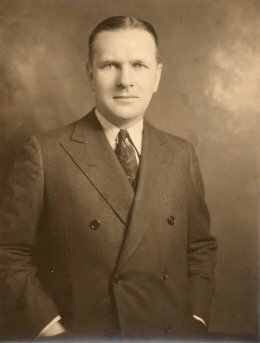 James D. Maver eventually settled in Larchmont, New York. He married Viola Lillian Schroth (1904-1950) who was of mostly German heritage. His children were James D. Jr., William, Robert, and Jane. James Dorward Maver passed away May 1973 at Pawleys Island, Georgetown County, South Carolina. He was laid to rest at Woodlawn Cemetery in the Bronx just a few feet down the row from former New York City Mayor Fiorello H. La Guardia.